A serene sci-fi exploration game, now on Kickstarter. "Players pilot a strange, spherical alien craft that can manipulate the laws of gravity," developer Exbleative elaborates, "on mankind’s first ill-fated mission outside the solar system. The gameplay mechanics are inspired by games like Tiny Wings (iOS), Journey (PS3), and Tribes Ascend (PC). Every aspect of the game is laser focussed towards delivering an entrancing, flowing and exhilarating feeling of movement across a range of alien exoplanets". There's more on the Exo One site. "Atmospheric, diffused visuals are merged with otherworldly sound effects and a hypnotic electric guitar soundtrack. 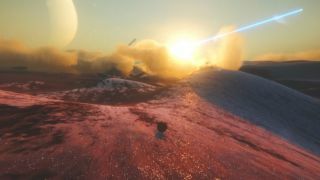 See amazing, high-sci-fi planets, float through boiling cloud formations, slide and roll down hill and mountain faces, and drift toward alien horizons." Yes please. As you can see from a recent trailer, below, you'll be accompanied on your journey by a narrator—although, as nice as the man's voice is, I do hope he's optional. I don't necessarily need story when I'm out exploring in my morphing xeno-ball. Exo One just hit Kickstarter today, with 29 days left to reach its $35,000 Australian dollar goal. Now, obviously you should take Kickstarter release date estimates with an entire cellar of salt, but for the sake of completeness I'm telling you that the team at Exbleative are aiming for the game to be out in January 2018.